INGREDIENTS: Chicken, Chicken Broth, Water Sufficient for Processing, Tapioca Starch, Dried Egg Product, Turkey, Natural Flavor, Tricalcium Phosphate, Sunflower Oil, Calcium Sulfate, Salt, Taurine, Carrageenan, Choline Chloride, Potassium Chloride, Vitamins (Vitamin E Supplement, Thiamine Hydrochloride, Niacin, Vitamin A Supplement, Pyridoxine Hydrochloride, d-Calcium Pantothenate, Riboflavin Supplement, Folic Acid, Vitamin D3 Supplement, Biotin, Vitamin B12 Supplement), Minerals (Ferrous Glycine Complex, Zinc Glycine Complex, Manganese Glycine Complex, Copper Glycine Complex, Sodium Selenite, Potassium Iodide), Magnesium Oxide, Thiamine Mononitrate. 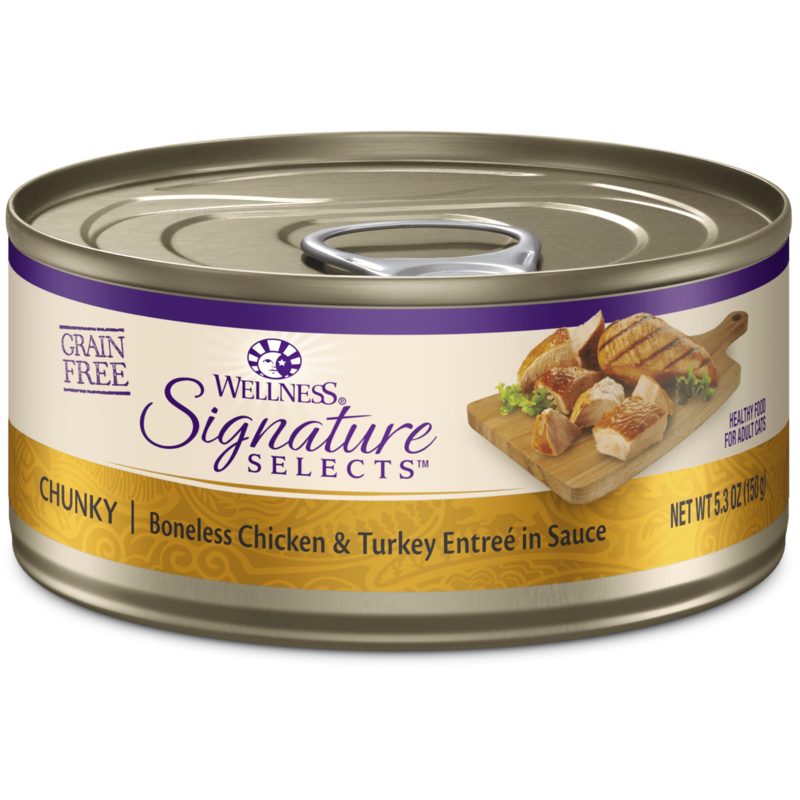 Wellness Signature Selects™ Shredded White Meat Chicken & Turkey Entrée in Sauce is formulated to meet the nutritional levels established by the AAFCO Cat Food Nutrient Profiles for maintenance. Calorie Content: (ME Calculated, as fed): 856 kcal/kg or 68 kcal/can.